Fourteen-time NHRA Funny Car World champion John Force was seriously injured in a crash Sunday in the O'Reilly NHRA Fall Nationals at Texas Motorplex. Force crashed along with fellow Funny Car veteran Kenny Bernstein in the second round of eliminations, after his Castrol Ford Mustang cut a tire and veered into Bernstein's lane. Force's car broke into two pieces and made heavy contact with the retaining wall, and Force was airlifted to Baylor University Medical Center in Dallas with a reported compound facture of his left ankle, deep cuts to his right leg and knee, a severely dislocated left wrist, and multiple broken fingers and hand abrasions. Bernstein was shaken, but uninjured. NHRA's attending physician, Dr. Dwight Shewchuk, administered emergency care on the scene, and described Force's injuries. "John has very serious injuries to his hands, his legs, and his feet that will require extensive treatment," he said. "Nothing appears life-threatening at this time, but he certainly has significant injuries." The 58-year old Force was alert and conscious -- though reportedly in severe pain --as NHRA Safety Safari officials worked to extricate him from the twisted remains of his racecar. The crash is the latest blow in what has been a season of tragedy for John Force Racing, after driver Eric Medlen was killed in a testing incident in Gainesville, Fla., earlier this season. Ashley Force withdrew her Funny Car after the crash. To view ESPN's footage of the crash, click HERE. UPDATE: John Force underwent surgery at approximately 9 p.m. CT, as doctors inserted three pins into Force's ankle, and three more to stabilize his wrist. He reportedly came through the surgery well, and an additional update is expected midmorning Monday. Longtime Sirius Speedway friend and NHRA.com Senior Editor Rob Geiger has written a tremendous book recalling the life and career of his best friend, the late NHRA Top Fuel star Darrell Russell. Nobody was closer to Darrell during his time at the wheel of Joe Amato's dragster than Geiger, until the tragic day in 2004 when Russell lost his life in a savage crash at Gateway International Raceway. 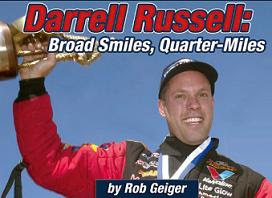 In Darrell Russell: Broad Smiles, Quarter-Miles, Geiger tells the life story of his fellow Texan; from his boyhood years in Houston to his life in the fast lane on the NHRA Powerade Drag Racing Series. The book is filled with behind-the-scenes stories of Russell's life -- both on and off the racetrack -- including some emotional memories from Russell's widow, Julie, who shares a side of her late husband that only she knew. The book also features exclusive interviews with Russell's close friends and teammates on the NHRA circuit, and Geiger's personal, first-person account of the crash that claimed his friend's life. "I wanted to put down in words the kind of person Darrell was, as a friend, a brother, a son, a husband and a drag racer," said Geiger. "He was an awesome individual, probably the kindest person I've ever met. The guy simply didn't have a mean bone in his body. He was incapable of saying or doing anything negative. "After he died, I realized that he touched so many people in his life, and that they all felt the same way that I did. Everyone loved the guy, and I wanted to capture that so we never let our memories of Darrell fade away." The book is already receiving rave reviews from around the motorsports community. ESPN Drag Racing analyst and former driver Mike Dunn said, "I thought I would take a week and read it in my spare time, but once I started, I could not put it down. We always knew Darrell was a great person, and now I know why. This is an absolute must-read, whether you’re a race fan or not." The book is available for $24.95, exclusively at JEGS.com. One hundred percent of the proceeds will be donated in Russell's name to DRAW, the Drag Racing Association of Women, a non-profit charity that helps injured racers and their families. Everything went as expected today in Dallas, Texas, with word that Dale Earnhardt Jr. will drive a #88 Hendrick Motorsports Chevrolet next season, with sponsorship from Mountain Dew, AMP Energy Drink and the Army National Guard. The announcement ends months of speculation over Earnhardt's number and sponsors for 2008 and beyond, and confirms widespread reports that NASCAR's most popular driver will run the number long associated with Robert Yates Racing, mirroring the number of the NASCAR Busch Series team he owns. Who Will End Up With NHIS? Kentucky Speedway Chairman Jerry Carroll met with New Hampshire International Speedway owner Bob Bahre Sunday, Carroll’s latest attempt to finagle a NASCAR Nextel Cup Series race for his track, by hook or by crook. "We love this sport, (and) we've been trying to do whatever it takes (to get a race),” said Carroll, making what may have been the understatement of the century. For those just emerging from a drug-induced coma, Carroll and his Kentucky cohorts are presently knee-deep in a federal anti-trust lawsuit against NASCAR and International Speedway Corporation, alleging that they have illegally conspired to deprive the track of a Nextel Cup Series race. NASCAR and ISC deny the charges, saying they informed Carroll that he was not a part of their plan, long before a single shovelful of dirt was turned in Sparta, Kentucky. That doesn’t matter to Carroll, however, a man who admittedly finds something he likes, then goes and gets it. "If there's a demand for something, you create a market," he said Sunday. "We know we have the demand. We knew the day we built it." 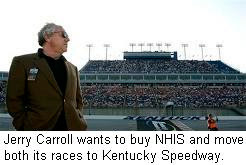 Carroll’s presence at NHIS inspired a groundswell of speculation that Bahre may sell his track to the Kentucky consortium, a move guaranteed to cost NHIS at least one of its annual Cup dates, if not both. I’m here to tell you it’ll never happen. I have chronicled Bob Bahre’s promotional career for the better part of 30 years, beginning with his days at the helm of Maine’s Oxford Plains Speedway, continuing through his purchase of the old Bryar Motorsports Park in 1989, and the construction of NHIS the following year. In that 30-year span, “Papa Bahre” and I have not seen eye-to-eye on every issue. But through it all, I never questioned Bahre’s commitment to his racers, New England race fans, or the France Family. It is that loyalty that will prevent Jerry Carroll from getting his hands on NHIS. A quartet of potential buyers has stepped forward; Carroll’s Kentucky Speedway group, International Speedway Corporation, Bruton Smith’s Speedway Motorsports, Inc. and a surprising new kid on the promotional block; Roush-Fenway Racing. SMI is believed to be a longshot. While Bahre and Smith have recently called a truce in the decade-long squabble that followed their nasty battle over the remains of North Wilkesboro Speedway – a tussle that resulted in NHIS’ second Cup date in 1997 -- it is believed unlikely that “Papa Bahre” will sell the track to his longtime rival. Carroll’s chances are slimmer still. Bahre still harbors resentment toward longtime Kentucky Speedway spokesmen Darrell Waltrip, over comments the former Winston Cup champion made about NHIS in the aftermath of the tragic 2000 deaths of Adam Petty and Kenny Irwin. “Something's... terribly wrong (with NHIS)," said Waltrip at the time. I won't say we shouldn't race there anymore, but NASCAR better find some answers before we go back." In May of this year, Bahre made it clear that those old wounds have not healed, telling the Boston Globe, “(Waltrip) was just trying to get a Cup date for Kentucky. I told Jerry Carroll…I couldn't deal with him because I couldn't stand Darrell Waltrip. Jerry Carroll is a guy I have a lot of respect for, but I told him I didn't want anything to do with selling my track to him because of Darrell Waltrip." ISC holds a comparatively strong hand. 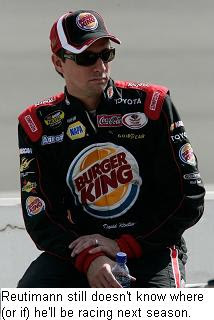 Throughout his promotional career, Bahre has been a staunch supporter of both the France family and NASCAR. He booked the Busch East and Modified Series at both Oxford Plains and NHIS for many years -- often losing money in the bargain -- because he believed Big Bill France would never steer him wrong. He built New Hampshire International Speedway with his own money -- initially scraping by on a meager diet of IRL, Busch, Craftsman Truck, Busch East and Whelen Modified Tour events -- hoping that NASCAR’s first family would eventually reward him for his decades of support. 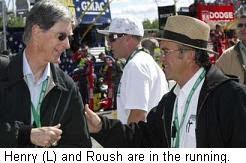 His gratitude to those New England race fans could sway Bahre to sell the track to Roush-Fenway Racing, since Jack Roush and his partner -- Boston Red Sox owner John Henry -- comprise the best hope of keeping two NASCAR Nextel Cup races in the Granite State. Carroll, ISC and SMI will surely move at least one of New Hampshire’s races to another venue. Roush-Fenway, however, owns no other tracks, meaning that both race dates will stay in New Hampshire, playing out before the fans that have supported Bahre so staunchly, for so long. In the end, loyalty will win out over profit. When the time comes to sell New Hampshire International Speedway, either ISC or Roush-Fenway will be chosen to take the reins. It's the Bob Bahre way. It’s official. 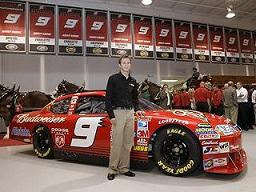 Budweiser announced this morning that Kasey Kahne will drive a red Budweiser Dodge on the 2008 NASCAR Sprint Cup Series. "Budweiser has a long and storied history with NASCAR and some of its most successful drivers. We're excited about Kasey's ability to add to that outstanding lineage," said Tony Ponturo, Vice President of Global Media and Sports Marketing for Anheuser-Busch. "Along with team owners George Gillett and Ray Evernham, we feel the pieces are in place for the #9 Budweiser Dodge to contend for NASCAR Sprint Cup championships for years to come." Kahne, meanwhile, said he is excited to be chosen to carry on Budweiser’s long tradition of NASCAR sponsorship. "The fan in me is thrilled because driving for Budweiser is the kind of opportunity you dream of when you break into this sport. I'm excited about getting behind the wheel of a car that's been driven by some of the best this sport has seen," he said. Bud began its NASCAR sponsorship run in 1993 on the then NASCAR Winston Cup Series. They have backed such notable drivers as Terry Labonte, Darrell Waltrip, Bill Elliott, Ken Schrader, Ricky Craven, Wally Dallenbach Jr. and (most recently) Dale Earnhardt Jr. Budweiser is also the "Official Beer of NASCAR," and sponsors the Bud Pole Award in all NASCAR divisions, along with the annual Budweiser Shootout at Daytona. Gillett-Evernham Motorsports co-owner Ray Evernham will join us today at 6 p.m. ET to talk about the new deal. Franchitti To Test At Talladega: Dario Franchitti will test a Chip Ganassi-owned car at Talladega later this month, in preparation for the ARCA race there on October 5. Ganassi said Sunday in New Hampshire that Franchitti will take part in an open test on September 27, before taking part in his first stock car race in early October. Ganassi declined to comment on plans to put the 2007 Indy Racing League champion in his#40 Nextel Cup Series Dodge beginning with next year’s Daytona 500, but sources say an official announcement could come as early as this week. Reutimann Still On The Fence: David Reutimann said this weekend that he expects to receive a contract proposal from Michael Waltrip Racing within the next few days, despite reports that neither Burger King nor Dominos Pizza will return to the #00 Toyota next season. Waltrip has said that he plans to continue fielding a three-car Sprint Cup team next season, and that he has verbal commitments from both Reutimann and Dale Jarrett to return, if sponsorship can be obtained. He acknowledged that he has no signed contracts in hand, and Reutimann said he has not yet received even a written proposal from Waltrip. 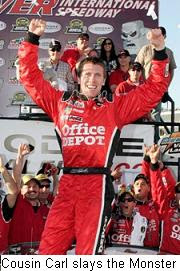 Last weekend, he called re-signing with Waltrip, “a solid option,” but said he cannot rule out moving to another team. Reutimann is rumored to be in the running for a proposed fourth Richard Childress Racing Chevrolet, after RCR extended its own self-imposed deadline to find sponsorship for the car until the end of this month. Saddle Up The Ponies: NASCAR is reportedly giving serious thought to converting its #2 series in a so-called “Pony Car” series, as soon as 2009. 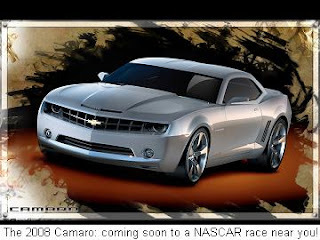 Sources say the Daytona Beach sanctioning body has received positive feedback from its teams about giving the series a new and unique look, by changing to the sportier Chevrolet Camaro, Ford Mustang and Dodge Challenger sheetmetal for the 2009 season. Toyota will run an as-yet undetermined model. No official decision has yet been made, but response to the idea in the Busch Series garage has reportedly been overwhelmingly positive. 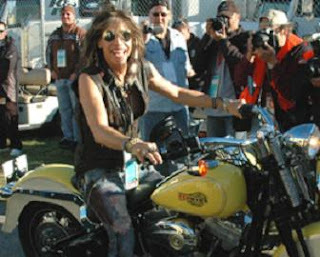 The mummified corpse of Aerosmith frontman Steven Tyler was spotted at New Hampshire International Speedway Sunday, propped up on a motorcycle. Had he lived, Tyler would have turned 107 in March! 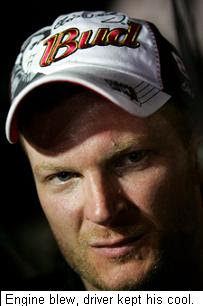 Dale Earnhardt, Jr. is out of the 2007 Chase For The Nextel Cup, after another in a series of ill-timed engine failures Saturday night at Richmond International Raceway. Earnhardt was running solidly in the top five with less than 10 laps to go when smoke erupted from beneath his Budweiser Chevrolet, sending him to the garage and out of contention. To be fair, Earnhardt's chances of making the Chase were already razor-thin, since both Kurt Busch and Kevin Harvick were running well inside the Top-20 when Earnhardt went up in smoke. Saturday night's explosion marked Junior's fifth blown engine of the season, and a 19% failure rate (five engines in 26 races) won't get you very far in NASCAR Nextel Cup racing. After the race, Earnhardt commented on the fact that DEI can't seem to keep engines together "when they drop them in my car." His remarks gave a fleeting glimpse into the frustation NASCAR's most popular driver is undoubtably feeling over his team's late season nosedive. Yates To Retire: Robert Yates announced this weekend that he will retire at the end of the season, handing the reins of over to his son, Doug. 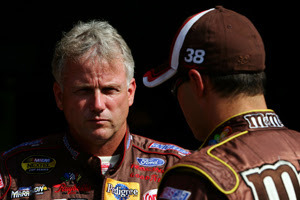 Yates Racing will field NASCAR Sprint Cup Series Fords for drivers David Gilliland and Travis Kvapil in 2008, with Kvapil replacing the retiring Ricky Rudd. Doug Yates said the recently announced merger with Champ Car’s Newman/Haas/Lanigan Racing will not take place, after all, with Yates relying instead on a strengthened alliance with Roush Fenway Racing, which will provide hardware, engineering, marketing and operational assistance. Petty-Evernham Merger: Kyle Petty said Friday that talks are underway to negotiate a possible merger of Petty Enterprises with Gillett-Evernham Motorsports. The move would create a new, four-car team under the Dodge banner, and Petty said new Gillett-Evernham majority owner George Gillett has proposed a merger that would allow the Petty’s to continue racing under their name. Combining the teams would force Gillett-Evernham to liquidate one of its three cars, in order to comply with NASCAR's new, four-team cap. Ray Evernham said that he is in favor of the move, and that four-car teams are the wave of the future in NASCAR. All parties stress that they are very early in the negotiating process. In other Gillett-Evernham news, Canadian driver Patrick Carpentier will drive a Nextel Cup car for the team before this season is over, as a prelude to a possible, full-time Cup schedule next season. Gillett told Montreal’s CKAC radio that there is "a very good chance” that Carpentier will race this season, and that if an upcoming test at Kentucky Speedway goes well, there should be a place for him on the team’s 2008 Nextel Cup roster. Stremme Out At CGR: Chip Ganassi Racing with Felix Sabates has declined to exercise its option on David Stremme's contract for 2008, leaving Stremme without a ride for next season. Team owner Chip Ganassi said Stremme is free to explore other options, but that he could still return to the team if sponsorship can be found. 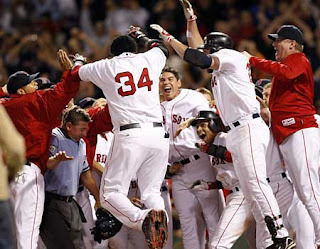 Current sponsor Coors Light announced last week that it will not return in 2008. 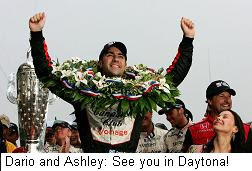 Ganassi declined to comment on widespread reports that recently crowned IRL champion Dario Franchitti is set to replace Stremme in the #40 Dodge next season, but sources in the IRL paddock at Chicagoland Speedway this weekend said the move is virtually a done deal. Franchitti has reportedly been offered a five-year deal to drive Ganassi's #40 Dodge next season, with sponsorship from Canadian Club (his current IRL backer) and Energizer. Franchitti clinched the IRL title Sunday with a stunning, last-lap pass of Scott Dixon, after Dixon ran out of fuel within sight of a potential championship-clinching victory. He declined to comment on his future following the race, saying, "I just want to celebrate this championship, and not worry about next year." GM Still Chasing Stewart: A top executive at General Motors says they will not let Tony Stewart get away without a fight. Joe Gibbs Racing confirmed this week that they will jump to the Toyota camp next season, taking Stewart and teammates Denny Hamlin and Kyle Busch with them. But GM’s Vice President of North American Sales, Service and Parts, Brent Dewar, said Friday that GM will attempt to re-sign Stewart with another Chevrolet team when his current deal with Gibbs expires. Dewar said Chevrolet will continue to support Stewart’s USAC and World of Outlaws teams until then, despite Tony’s recent statement that he hopes to sign a contract extension to finish his career with Gibbs. Joe Gibbs Racing made it official today, announcing that they will field Toyota Camrys in the NASCAR Sprint Cup and Grand National Series, beginning in 2008. Team President J.D. Gibbs said the opportunity to be at the top of Toyota's pecking order played a major role in his decision to switch. "We’re going to have more of a leadership role, that’s probably the key thing," he said. "GM has four really strong teams, and it’s probably a little more difficult, figuring out who has the leadership role." The Gibbs team has been associated with General Motors since its debut in the 1992 Daytona 500; fielding Chevrolets from 1992 through 1996, switching to Pontiac in 1997, then back to Chevrolet in 2003. They have won three Nextel Cup titles -- Bobby Labonte in 2000, and Tony Stewart in 2002 and 2005 – and have Stewart and Denny Hamlin in position to challenge for a fourth this season. Toyota has struggled mightily this season, failing to qualify for a large number of races. While their fortunes have improved in recent weeks, Toyota still has fewer Top-10 finishes (10) than either Stewart (17) or Hamlin (14). Rudd Hurt In California, Wallace To Be Tabbed For Fill-In Role? Ricky Rudd suffered a shoulder injury during a six-car pileup on lap 181 of last night's Sharp Aquos 500 at California Speedway. Rudd climbed into an ambulance and was transported straight to Yorba Linda University Medical Center for evaluation, bypassing the track’s Infield Care Center. While NASCAR officials said he was treated and released, PR representative Jessica Rohlik confirmed Monday that Rudd has a separated left shoulder, and will see his personal physician early this week in Charlotte, NC. She said no decision has been made concerning his ability to race at Richmond International Raceway this coming Saturday night. If he is not able to go, Kenny Wallace is believed to be the leading candidate to replace him. Wallace was scheduled to meet with team owner Robert Yates yesterday to discuss replacing the retiring Rudd in the #88 Ford next season. Keselowski Rides Out A Wild One: NASCAR Busch Series rookie Brad Keselowski escapted serious injury Saturday night in a fiery, 140-mph crash in turn one at California Speedway. Keselowski was caught-up in a four-car incident with AJ Allmendinger, JJ Yeley and Eric McClure that saw his car nearly overturn before bursting into flames ariding the top of the SAFER barrier for nearly 200 yards. He emerged from his demolished racer favoring his left leg, but was treated and released from Loma Linda University Medical Center after CT scans and x-rays of his left ankle and chest were apparently negative. He is scheduled to be examined today in Charlotte, NC by neurosurgeon Dr. Jerry Petty after impact marks were found on his helmet following the crash. If you haven't seen the crash yet, you can check it out HERE. New Majority Owners At Hall Of Fame: Two executives of the Arizona Diamondbacks have purchased a majority stake in Hall Of Fame Racing from Troy Aikman and Roger Staubach. Jeff Moorad, Chief Executive Officer of the Diamondbacks, and Tom Garfinkel, the team’s Chief Operating Officer, were introduced as the new controlling owners of Hall of Fame Racing yesterday at California Speedway. Aikman and Staubach will remain involved as minority owners. There is no word on whether the team will continue its relationship with Joe Gibbs Racing next season, after JGR announces its move to the Toyota camp Wednesday. Hall of Fame Racing General Manager Philippe Lopez said the team has not yet decided how to proceed, and could remain with Chevrolet by forming an alliance with a team like Richard Childress Racing or Hendrick Motorsports. In other ownership news, Texas Rangers and Dallas Stars owner Tom Hicks attended yesterday’s race at California Speedway as a guest of Richard Childress. Hicks called the invitation “social,” and declined say whether he may be interested in investing in a NASCAR team. He is also the co-chairman of the Liverpool Football Club, along with new Gillett-Evernham Mototrsports majority owner George Gillett. 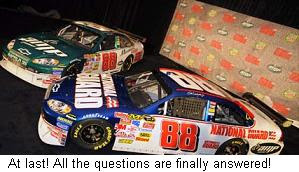 Junior's New Sponsors: ESPN.com is reporting today what Sirius Speedway first told you more than a month ago, that Pepisco’s Mountain Dew and Amp Energy Drink brands will sponsor Dale Earnhardt Jr.’s Hendrick Motorsports Chevrolet next season. A formal announcement is expected later this month.